Disability Rights Group Sues San Diego Over Scooters On Sidewalks A lawsuit claims that San Diego has failed to keep rental scooters off the sidewalks, and that makes sidewalks unusable for people with disabilities. 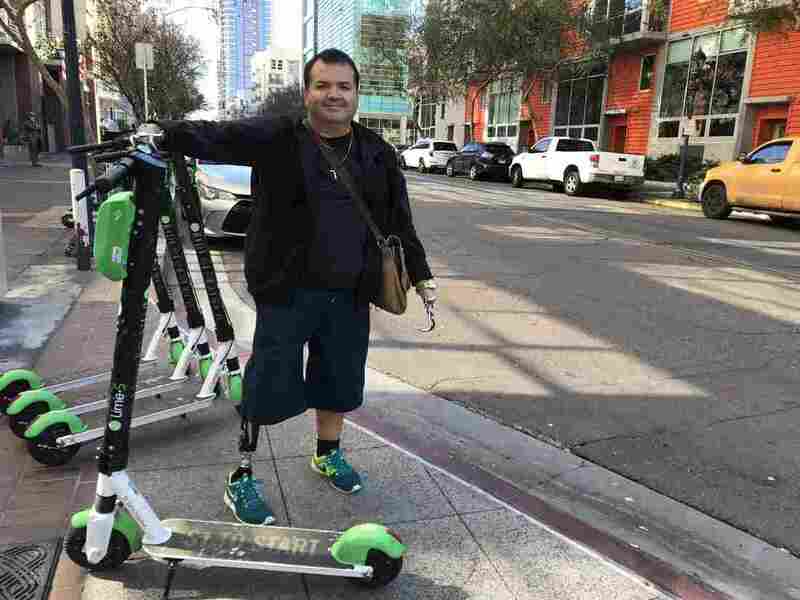 Alex Montoya, who was born missing his right leg and both arms, is a plaintiff in a federal disability rights lawsuit targeting San Diego and scooter companies Lime, Bird and Razor. Electric scooters have taken cities across the country by surprise, sometimes causing conflicts with city authorities and pedestrians. In San Diego, the scooters have led to a federal lawsuit claiming the new devices cause discrimination against people with disabilities. The lawsuit, which was filed in a federal district court in January and seeks to be a class action, claims the city and scooter rental companies Lime, Bird and Razor have failed to prevent people from riding or parking scooters on sidewalks. Scooters have blocked people with disabilities from accessing the public right-of-way, the plaintiffs claim, and have turned sidewalks into a "vehicle highway" where pedestrians are at risk of injury. "People with disabilities who wish to travel in the City using the City's walkways are being forced to either put their physical safety at risk or just stay home," the complaint reads. "This is not a choice that they should have to make." The lawsuit seeks a court order prohibiting scooters from being parked or operated on sidewalks, crosswalks, curb ramps and other walkways. Scooters started showing up in San Diego and cities across the country roughly a year ago. They are part of what industry insiders call "micromobility" — the use of small, wheeled devices, usually linked to smartphone technology, to travel relatively short distances. Complaints about scooters came swiftly, and some cities have banned private rental companies from placing scooters on their streets and sidewalks. It's really such a scary endeavor. Because of my prosthetic leg, I can't get out of the way as quickly. San Diego has taken a far more cautious approach to scooter regulations, with some city leaders warning that reacting too hastily could cause the city to miss out on their potential to reduce greenhouse gas emissions, most of which come from cars and trucks. A set of regulations proposed by Mayor Kevin Faulconer would, among other things, require scooter rental companies to automatically reduce speeds in certain high-pedestrian zones. Alex Montoya, one of the named plaintiffs in the lawsuit, was born missing his right leg and both his arms. He uses prosthetic limbs and says he chose to live in the East Village neighborhood of downtown San Diego because it was easier for him to get around without a car. Montoya says since the arrival of scooters, he has had to remain hyper-vigilant to avoid getting knocked down by scooter riders, most of whom he observes riding on the sidewalk. "It's really such a scary endeavor," he says. "Because of my prosthetic leg, I can't get out of the way as quickly." Riding motorized scooters on sidewalks is illegal under California law, as is parking them — or any other object — in such a way that blocks pedestrian or disabled access to public walkways. Montoya says he has not seen those laws adequately enforced downtown. San Diego Police Department data show there were 551 citations issued to people for riding a scooter on the sidewalk in 2018. Police issued more than four times as many citations to people riding without a helmet — something that, as of Jan. 1, is no longer illegal for people 18 and older. Sophie Wolfram, director of programs at the nonprofit Climate Action Campaign, says it's unacceptable that people with disabilities fear for their safety because of scooters. She says people's tendency to ride on sidewalks shows how unsafe they feel sharing a lane with cars. Plans for protected bike lanes downtown and throughout the region have faced numerous delays. "It's not fair to ask people to risk their necks every time they want to make a trip on a scooter by riding in traffic," Wolfram says. "So there's a lot that the city can do and needs to do to build protected space that makes it safe for scooters. And when the city does that...it also makes it safer for pedestrians to reclaim the sidewalk for slower uses." Wolfram added that much of the criticism of scooters — that they are nuisances, eyesores or safety hazards — can easily be applied to cars, as well. Car crashes kill more than 100 people per day, according to the U.S. Department of Transportation. Wolfram says scooters disrupt transportation in ways that have "exposed some biases we have about how we should move around our city, and what kinds of mobility devices we accept having strewn about our city." The San Diego City Attorney's Office says it would respond to the complaint through the courts. Katie Stevens, Lime's senior director of government relations for the west, says the company has invested $3 million in a safety education campaign, frequently gives away free helmets and employs a team of on-the-ground responders to move illegally parked scooters. "We are also convening an industry-wide education and safety summit on micromobility," she says. The summit will include disability rights leaders, she says, and will focus on "making sure that these micromobility models thrive in a very safe environment." Attempts to reach Bird and Razor for interviews were unsuccessful. Lawsuit plaintiff Alex Montoya says he was encouraged by the mayor's willingness to regulated scooters, and that he understands their appeal as an alternative to cars. "I think the scooters are a great invention," Montoya says. "But I think if they are here to stay, they need to be really regulated in a way that's safe for everyone."